This novel (officially released today), has become, unequivocally, one of my favourite books (I was lucky enough to get a “sneak preview”). It is an amazing paranormal love story rivaling some of the sweetest tales. It will have you chuckling, teary eyed, and “love drunk” midway through. Set in Victorian London, the novel introduces us to a group of six children, each gifted with a specific supernatural ability, and the ability to see (but not hear) ghosts. Their duty is to form an alliance called “The Guard” that protects humans from restless spirits. At the time of their formation, a beautiful “oracle” of sorts, informs them of their upcoming duties, selecting “Alexi Rychman” as the group leader (the oracle seemingly has an emotional tie to him from a deep past). She informs them that they will eventually encounter a “seventh” that will complete their group but warns them of a potential threat that may mislead them into not fulfilling their destiny (which could result in catastrophic events). “The Guard?” Rebecca piped up confused. As adults, the individuals that make up the “Guard” have attempted to lead normal lives by keeping conventional occupations. Some run a local pub, while Rebecca and Alexi have started a school (Rebecca being headmistress, and Alexi, one of the professors). Eighteen year old Percy Parker, enrolls in their school. Orphaned at birth, and raised in a convent, she has lived a sheltered life. Due to her very unique appearance (ghostly features with fair white skin, and long white hair), she is extremely shy, and self-defeating, and hides behind cloaks of scarves and eyeglasses so as to avoid the constant snickers of those around her. She also has her own rare gifts, that I will leave you the luxury of discovering. Nonetheless, her distaste for science suddenly seemed an extraordinary misfortune, as she hated the thought of doing poorly in a class taught by someone so breathtaking. and the professor offers to tutor her. While the brooding and elegantly handsome Alexi (someone mentioned, the actor “Richard Armitage” and I concur!) keeps his professional guard up, he finds himself intrigued with Percy’s gentle disposition, and gradually helps her develop self-confidence. He also finds his own highly guarded seclusion dissolving with each of Percy’s highly anticipated visits, and opens himself up to experience the friendship that is building between them. In an effort to make his student more at ease, Alexi did his best to appear wholly disinterested as she carefully removed her protections with delicate, private ceremony. But then she turned to face him, clutching those items that had held her unusual features in mystery. He forced his eyes to his book. Alexi looked up. 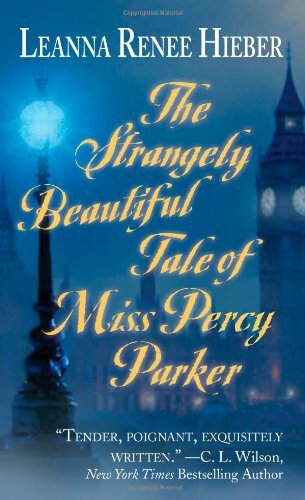 Though Miss Parker’s hands clearly trembled, her voice did not. His furrowed, generally disapproving brow rose slightly, and he leaned back in his chair and took her in. Luminous crystal eyes held streaks of pale blue shooting from tiny black pupils. A face youthful but devoid of color, smooth and unblemished like porcelain, had graceful lines as well defined and proportioned as a marble statue. Her long, blanched locks shimmered in the candlelight like spider silk. Upon high cheekbones laid hints of rouge – any more would have appeared garish against her blindingly white skin, but she had been artful in her application. Her rosebud lips were tinted in the same manner. Here is an excerpt from one of my favorite “silly” moments of the book. Ahhh… how am I to capture just a small part of such an amusing repartee, and have it convey enough of the “laugh factor”? I will attempt by describing the scene: The crew (minus Alexi) are having a laugh at Alexi’s expense in regards to his dark, brooding and oft too serious disposition. Through the laughter, they failed to hear the door open and click shut, and a tall, cloaked formidable figure dressed all in black approached. His stoic features were offset only by his blazing eyes. Alexi Rychman stared down at his friends with a frown. At the sound of his low, rich voice, the group look up and shrieked, delighted. Elijah cried out the first notes of Beethoven’s Fifth, unable to help himself. This did nothing for the other’s composure. In fact, Michael, head thrown back in a wail of laughter, lost balance and fell from his chair. This section had me laughing out loud, and I was hooked! Eventually, a beautiful stranger haphazardly makes her way into their lives, accompanied by many “signs” that were prophesied long ago, on that fateful night of their integration. While they are certain that she is their long-awaited “seventh”, Alexi suspects that the “seventh” may actually be Percy. The Guard, who commonly share an earnest and fun camaraderie, feel divided as they notice a difference in Alexi’s demeanor. They fear his regard for his pupil could affect his better judgement. Before I accidentally divulge “spoilers” for this amazing story, I implore you, for the benefit of your own happiness, to read this book (there is MUCH more, I promise you)! You will be delighted in the intriguing mystery of Percy. The potential merging of powers, with secrets that could change the fate of the world, foreboding danger along with the exquisite delight in a budding romance between a trusted teacher and his student, a lonely soul and a gentle heart, will keep you riveted until the very end. I was so deeply captivated by the story, that I completely forgot to eat! You will be delighted in the twists and turns that will unfold in a tale full of surprises that you didn’t see coming (and you’ll find yourself heartbroken to realize you’ve reached the end), but fear not! Leanna will be indulging us with three more books in this series. While the story, in itself is fascinating, the author has a haunting way with words, that will caress your very soul. With an abundance of romantic tension and angst, mystery, and adventure, you will be hard-pressed to put it down. This is so accurate and compelling a review! The prose is simply lovely, the characters well formed and real–you can tell this even from the briefest of excerpts. Marvellous! Can’t wait to read! good review…i can’t wait until my copy arrives. Maryse you stun me with your words, I’m so very grateful. Your review is being linked on all my sites. Thank you so much for this, I couldn’t be more thrilled.